While previous research has shown that negative emotions related to fear and disgust are communicated via detectable regularities in the chemical composition of sweat, few studies have examined whether the same communicative function holds for positive emotions. 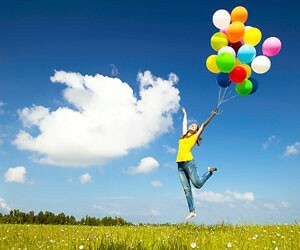 This is a photo of a happy woman jumping, holding balloons.“Our study shows that being exposed to sweat produced under happiness induces a simulacrum of happiness in receivers, and induces a contagion of the emotional state,” explains psychological scientist Gün Semin of Utrecht University in the Netherlands, senior researcher on the study. The sweat donors came to the lab, rinsed and dried their armpits, and had absorbent pads attached to each armpit. They donned a prewashed T-shirt and sat down to complete the study tasks. They watched a video clip intended to induce a particular emotional state (fear, happiness, neutral) and they also completed a measure of implicit emotion, in which they were asked to view Chinese symbols and rate how pleasant or unpleasant each one was. The sweat pads were then removed and stored in vials. Initial data analyses confirmed that the videos did influence the emotional states of the male participants — men who watched the fear video showed predominantly negative emotion afterward and men who watched the happiness video showed predominantly positive emotion. These findings, while preliminary, suggest that we communicate our positive and negative emotional states via distinct chemosignals, such that the receiver produces a simulacrum of the sender’s emotional state. The researchers note that the fact that some measures indicated emotional contagion, while others did not, may highlight the difference between measures of emotion that draw on language versus those that don’t. The findings have broad relevance — emotion and sweat are two core features of the human experience, after all. But the fact that happiness may be communicated chemically could be of particular interest to the “odor industry,” says Semin, due to its potential commercial applications. “This is another step in our general model on the communicative function of human sweat, and we are continuing to refine it to understand the neurological effects that human sweat has on recipients of these chemical compounds,” Semin concludes. Study co-authors include Jasper H.B. de Groot of Utrecht University; Monique A.M. Smeets of Utrecht University and Unilever Research and Development; and Matt J. Rowson, Patricia Bulsin, Cor G. Blonk, and Joy E. Wilkinson of Unilever Research and Development. The research was supported by Unilever Research & Development (AGR 01049/OIV120260).